When I last posted I was looking over Minnis Bay, Birchington, looking west towards Reculver. The aim was to drive along as much of the coast as possible, stopping to take images of the variations in the Thanet coastline and it’s protection against the sea. Nostalgic memories abounded too of trips to different bays in my youth, whether running or cycling in most cases. Looking east towards Margate showing how the chalk is now visible. 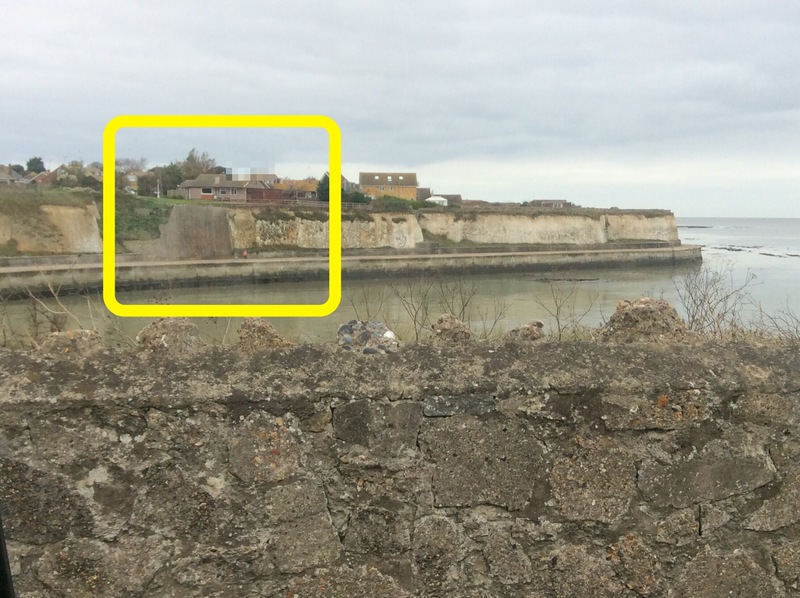 This is a #skitch annotated image of a sea defence which a local householder originally built to defend his property when I was at school back in the late 1970s. An early brick based defence was eroded behind undoing its effectiveness. The concrete defence is more solid than I remember in the past. The solid base sea wall is one that is familiar along stretches of the chalk in many parts of Thanet from Birchington to Ramsgate. The top of the cliffs has seen some older residences that I remember have been replaced with large New England style clad properties. The Royal Sea Bathing Hospital at the border of Westbrook and Margate is now residential. 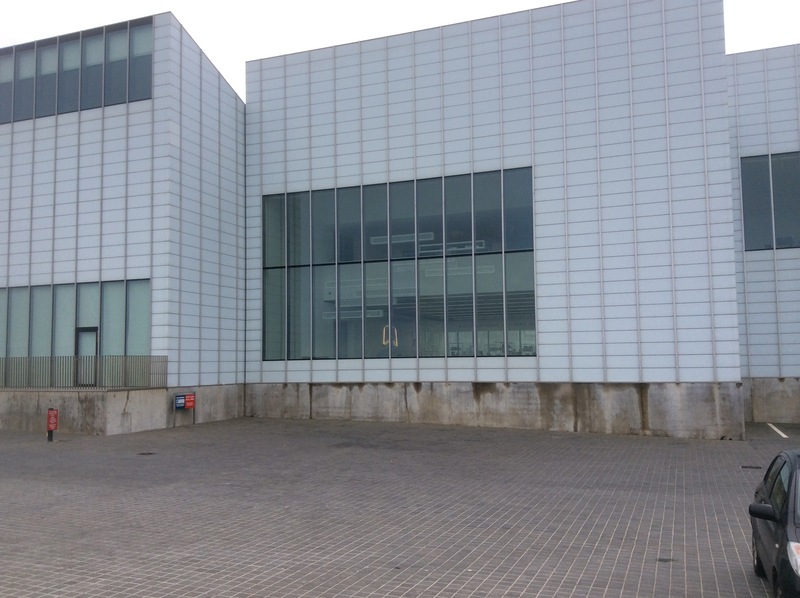 Along the seafront at Margate’s Golden Sands there is much evidence of urban decay and new defences run from the harbour which also houses the Turner Contemporary. On past Cliftonville and Palm Bay, a favourite cliff top location for kiting in the past and memories of being pulled this way and that. The pitch and putt course has gone and in the distance the sewage works has been expanded. Built to blend in as the building mirrors the colouring of the cliffs. 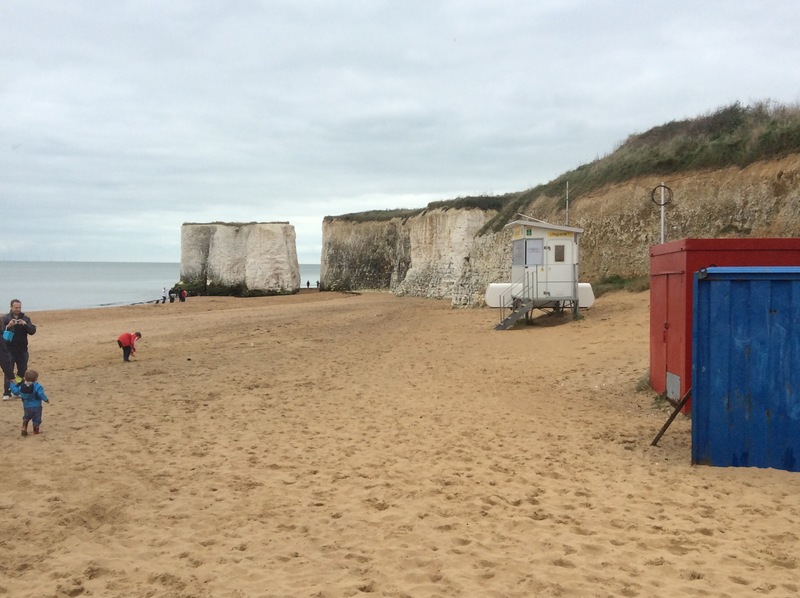 On through the linking housing area to Botany Bay, Kingsgate – used in adverts for BP? And athletes running along the beach. A brief stop and walk down to the beach – makes me realise why am I just rushing rather than enjoying the beach. Then on inland to approach Kingsgate Bay and the arch which, it was feared might collapse last winter. Double yellow lines stop me from parking up. Onwards to Joss Bay which in my youth had no sea defences. Then they created a dune to the north side of the beach, then a sea wall that also protects the cliff top properties. I first came here on primary school day trips when I lived in Chatham, Kent in the early 1970s. There are some paddle boarders out in the bay enjoying the calm conditions. 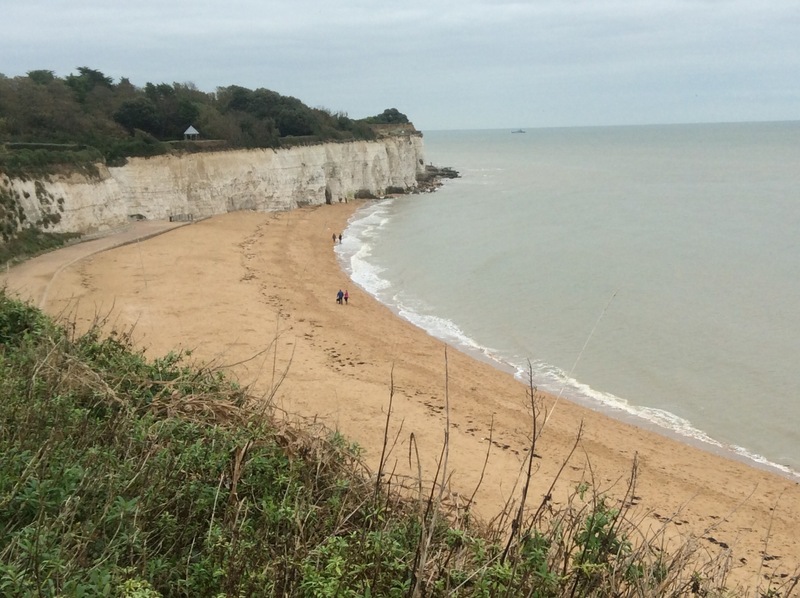 Finally into the edge of Broadstairs and Stone Bay, looking north back towards Joss Bay and an unprotected area of cliff. If I had continued the cliffs maintain this height and even rise to Ramsgate then descend to the bay at Pegwell Bay, south of Ransgate close to Richborough castle and the other end of the Wantsum channel mentioned at the start. I hope you have learnt a bit about the coastal features from this post. For those who read the dip post during half term. It took 2 to 3 days and then distraction through the form of a visit to London to visit the …. No, the poppies at the Tower and City Hall to see photos linked to the Greater London National Park idea in conjunction with QMU Geography department. I was still wiped out, the crowds drained me even more but the dip was broken. The brain is firing again, I am sleeping better and a new half term beckons. Yes, it will be hard work but that’s my job. Thanks for those who sent messages of support on the blog and via Twitter it’s always appreciated. It’s half term, I had an intense first half term in my new post. My head will not settle to any thoughts for long; sleep patterns vary but are inconsistent; I am weary and low of spirit. Those around me sense it too, but there is little that I seem able to do. Exercise – no energy. Read – poor focus. Surf – some but again focus is all over the place. Rest – trying. Sunday morning sees me driving down to East Kent to visit my parents, sister who returns to New Zealand tomorrow and to see Mum’s new nursing home. 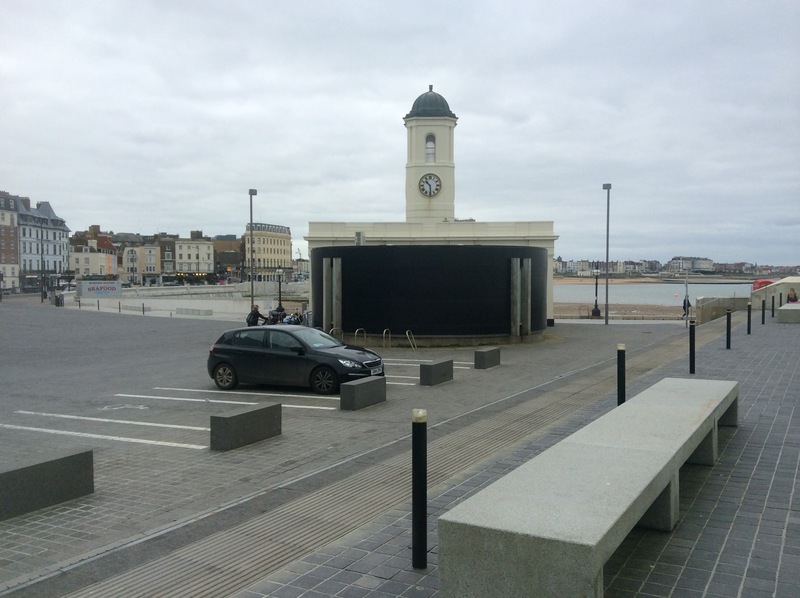 I arrive early while they are at church so go on a nostalgic geographer trip around the north coast of Thanet. As I am a geographer I take images of the coastline for future lessons on The Thames estuary, coastline, coastal defences, geology, tourism, …whichever takes my fancy really. As I approach the “Isle” formerly cut off from the mainland by the Wantsum Channel which is guarded at each end by Reculver and Richborough forts. I pull off the dual carriageway, look across the marshes to the coastal wall. Then on , up on to the island. I drive down to Birchington on Sea and look back to Minnis Bay. Cedric has been a friend for many years. He first came into my life as a teenager. We met through a mutual love of classical music. We have shared good times and bad. For many years now our contact has been infrequent, although I can visualise him sitting in the room with his case beside him. His case? Yes Cedric always has a hard shell case with him. He calls it his protective shell. When Cedric speaks the timbre of his voice is a wonder to behold sometimes a little scratchy at first he soon resonates and sounds beautiful, you can listen to him for hours and if you close your eyes the sound echoes around inside your head arousing creative thoughts. Now at this point I must confess, it is almost 6 years since I have held Cedric. Oh, sorry, did I not mention Cedric is my Violincello. He was bought for me by my parents when I was a teen. Found in a family’s loft his history was unknown but his sound was lovely. No craftsman’s priceless piece, a jobbing cello. He saw me through Principal cellist in my district youth orchestra. He accompanied me to stay with musical family friends in Bremen, Germany – his hard shell case still carries stickers from that trip in 1981. We went to college in Cheltenham where he was a regular in the show orchestra. After rehearsals we would run across the town together to get back for dinner at my hall of residence (FCH). Often dividing the coach line outside the Ladies College as we passed. Occasionally I was reckless enough to cycle back with Cedric’s case shoulder strap over head and shoulder. The traffic respected our presence by parting wider than usual. We have played in school orchestras in Basildon, Harlow and Romford. We once joined an amateur orchestra in Broadstairs. Our finest hour had to be performing the Prelude from a Bach cello suites for a colleague’s wedding when they signed the registers – we practised for a year for that and I am still to see the DVD, but any compliments were given at the reception that evening. Since then Cedric and case have travelled to the loft, the living room, a variety of bedroom corners but this week I opened his case. I had returned home weary, a headache meant that I could not read anything. I sat quietly and retuned his C string, the only own that had slipped – there’s reliability for you. Then I took over my son’s room and extended the spike and began to play. Soon said bedroom occupant appeared from downstairs to investigate. As tablets eased my headache I retrieved my glasses and the sheet music for the Bach suites and played through some sections. Within half an hour, my spirits refreshed and my skin reacting unfavourably with the dust and metallic strings I stopped, put Cedric back to bed and returned downstairs. Why a blog post – because this was an epiphany moment for me and one that I need to repeat, why have I denied myself this pleasure for so long. Cedric is not on twitter (an account beckons? Maybe), he is an old friend with whom I share a skill – that of learning over many years to play a musical instrument. He has been part of my life for over 30 years and I am so glad that we never parted as many musical friends did with their instruments. I need to make more beautiful music with him as “Cedric is out and proud”. Do any of my readers have long dormant musical interests or talents? Embrace them, share your music once more.